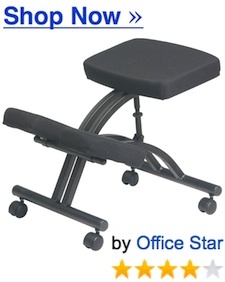 Knee chairs have been classified as an ergonomic office chair because they address common long-term sitting issues. These issues often affect the back from the poor posture usually seen with the regular style of chair. This particular style of chairs are considered to be healthy because of the way they “open” up the pelvic angle while working. Regular chairs can leave you in a crumpled heap. Are Kneeling Chairs Good for Your Back? Generally the people who are happiest with this chair are average size people. People who are very tall have difficulty finding a kneeling chair to fit – although here is one that taller people have found comfortable. Obese persons also have difficulty finding a comfortable kneeling chair. For the most part the added pressure on the knees as well as the narrow seat does not provide a healthy sitting position. If you have severe back problems, knee injury, or other spinal issues you may wish to speak to your physician or be referred to an ergonomic specialist to see if this is the answer you are looking for before you invest. Another option to consider is just using your kneeling chair intermittently throughout the day and using it for a positional change instead of a full-time seat. Working long hours at a desk or at the keyboard in a kneeling position might be better for your posture but you are still prone to the same negative consequences of being immobile for long periods of time. People who love the kneeling chair are those who need to reach in front of them regularly to do their work. Writing, sewing, piece-work, and assembly line workers like the freedom of this style of chair. Some chairs have casters so you can roll about and others have rails like a rocking chair for easy forward and back motions. Styles also include wooden frame, metal frame, with and without back support. Because the kneeling chair requires a more exact “fitting” of the body to chair the more popular models are adjustable to provide comfort. The chair seat should be wider than your hips so you don’t have an uncomfortable balancing feeling. The seat should be adjustable so you can ensure you have enough distance from the seat to the knee pad so you aren’t folded into an uncomfortable position. You also want to be able to get in and out of the kneeling position easily. Both the seat and knee pad should be padded enough to provide a relaxed seat so you are free to concentrate on your tasks. The seat should also adjust by angle so you can open your hip angle for better posture. The more open the hip, the more comfortable it will be to breathe deeply and sit up straight. Some people have commented that they feel confined to a certain height and now find it less comfortable to work from their regular desk. One recommended fix for this would be to continue outfitting your office space ergonomically and add an adjustable keyboard and monitor mount to your desk so you can truly work in comfort. This particular design does come with casters so you can move about. 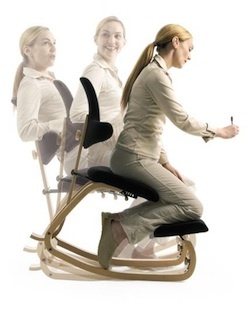 Not the way you do with the regular style of chair but you can easily move around from one workstation to another. The seat cushion on this one has memory foam for added comfort. 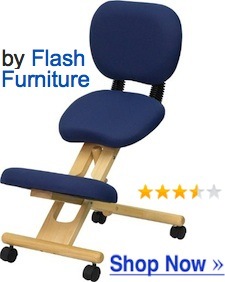 People who love this chair rave about how much it has helped their backs. Back and spine issues caused by everything from heavy lifting injuries causing bulging disks to automobile accidents resulting in a myriad of injuries. Even people with sciatica have commented how much they favour this chair. They like that the fabric is made of a comfortable material and rave about the range of adjustability you can get to ensure you will find a comfortable and supportive position. The chair is made of a sturdy steel frame and comes on rugged casters. Because of the wide range of adjustability, this chair has been given the thumbs up from the taller people using it too. This style comes with a back rest. On the positive side this chair is made so you can work in your usual kneeling position or relax by reclining back onto the back rest. The open angle of the seat is designed to encourage better breathing. The seat is padded with a thick material and the seat adjusts for height and angle. 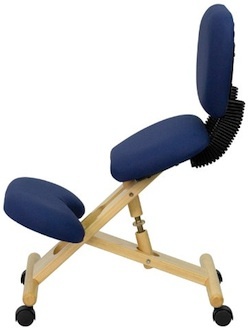 People find this chair to be sturdy, very comfortable, quick and easy to assemble as well as providing relief for various hip, back, spine and even groin injuries and other problems. 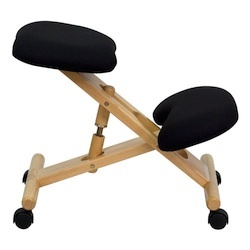 Other people have found that it has a nice “balance” and provided a stable working seat. Although this one is over $100 the general consensus is it is well worth the price and considered to be very economical. This is another chair. 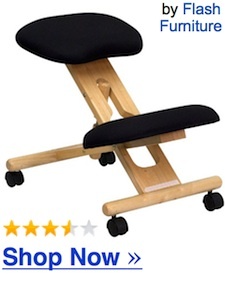 The people who really like it also have back issues they find are being helped by this chair. Attractive design and nicely finished the wooden frame is strong and supportive with several ways to make minor adjustments to suit your needs. The fabric upholstery is nice and the seat and knee padded area are thickly padded with a dense foam. This is a lesser expensive chair option that still provides all the benefits of the more expensive ones. Negative comments have included some manufacturer defects. I am contemplating purchasing a kneeling chair as I have a lot of neck, shoulder and mid-back pain from sitting for long periods of time in an office chair. I’ve had 3 MRIs in the past year on my back & spine, all showing no major problems. I suspect it is my posture. 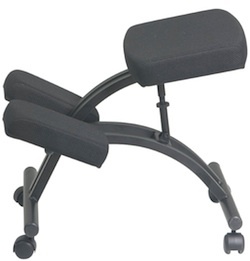 I see ads on kneeling chairs that have a rolling base with casters and ads on chairs with a “rocker” base. Can you tell me which is the preferred type? I haven’t a clue. The rocker chairs claim to keep your body in motion, forcing it to “constantly balance” your body, creating a stronger core. The roller types just stay in one position. Can you tell me the difference? I’ve been to physical therapists, chiropractors, massage therapists, spine specialists — you name it. None has offered relief. I am literally in pain 100% of the time. Thanks for your help & suggestions & I look forward to your prompt response! Have you tried Yoga? 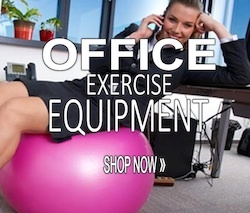 And have you tried adding some fitness into your work day? Perhaps try setting the timer so you can give your body a standing/ walking break. Do some stretching and toning during the day might help and then adding a Yoga class at the end of the workday to give your body a treat. Being sedentary can be the cause of neck/shoulder pain. As far as “preferred” kneeling chairs – that would be up to you. 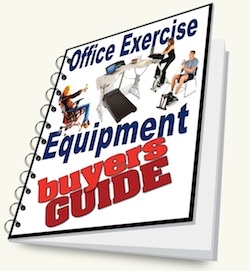 If there is an ergonomic furniture shop close by they will have an assortment to try out.